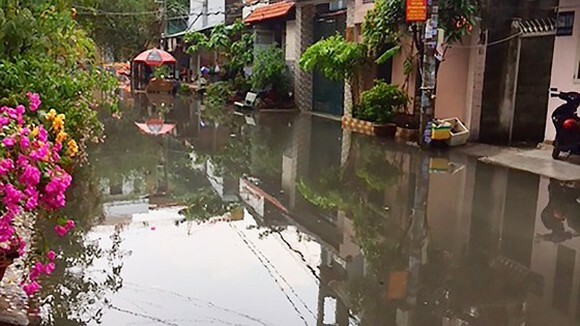 Flooding was seen everywhere in Ho Chi Minh City after the downpours yesterday, city dwellers worried that inundation would get worse during this year’s rainy season as the VND10 trillion (US$438.5 million) project on flood management measures has been halted indefinitely to wait for completion of related paper formalities. Though 75 percent of the project had been carried out, the project investor - Trungnam group – decided to halt it from April 27. Explaining the reason for the project halting, the company said that the Bank for Investment and Development of Vietnam (BIDV) stopped disbursement for the project because the city People’s Committee has not signed the project disbursement report for recapitalization procedure. The investor will start the project just after the bank and city authorities finish paper formalities of disbursement. The VND10 trillion anti-flood project was begun in June, 2016, comprising of six big sewers Ben Nghe, Tan Thuan, Phu Xuan, Muong Chuoi, Cay Kho and Phu Dinh. Additionally, it has an embankment along Sai Gon river with the length of 7.8 kilometer to protect major areas. With the aim of preventing floods for the area of 570 square kilometers, it is scheduled to finish on April 30 this year but it failed to finish on time because districts are late in land reclamation. Streets To Ngoc Van and Pham Van Dong in Thu Duc District remained more than 30 cm submerged after yesterday heavy rain causing difficulties for vehicle drivers meanwhile their peers in Le Van Viet in district 9 were struggling to run. Numerous people had to wade through flooded street La Xuan Oai in the same district on their way home, as a rainfall kept pouring down for hours in the late afternoon. In a bid to reduce flooding in the rainy season, the city anti-flooding center are striving to finish projects to tackle inundation including Me Coc in district 8, Luu Huu Phuoc and Luong Dinh Cua in district 2, Ton That Hiep, Ho Van Tu in district 11, Truong Vinh Ky in Tan Phu district, An Duong Vuong in district 6 and Huynh tan Phat in district 7. The center has also conducted maintenance and dredging of canals and rivers in the city. Moreover, it has piloted to lease the pump with a capacity of 27,000 to 96,000 cubic meters per hour to work in Nguyen Huu Canh Street in Binh Thanh District, which is often susceptible to flooding due to rain and high tides. Chairman of the municipal People’s Committee Nguyen Thanh Phong has ordered related agencies to take heed to fight flooding in rainy season.